Spectacular Mountain retreat located in the heart of the Canadian Rockies. This luxury retreat is only 1 year old and complete with new furniture. On the lower level, there are two bedrooms that share a large bathroom which includes a bathtub and shower. There is also a pocket door which closes off the two bedrooms and bathroom for additional privacy. Also on this level is a den with comfortable couches and a TV, a mudroom and laundry room,and the single car garage. This floor also features access to our very large outdoor hot tub located on the edge of the forest. 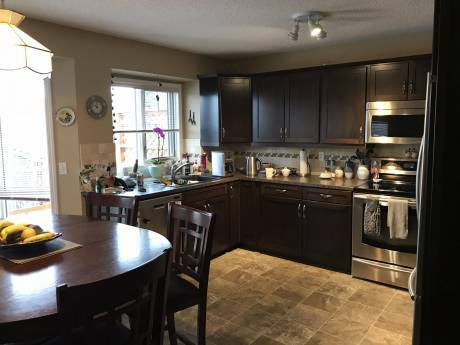 The upper level is an open concept living area that includes a wood fireplace, large kitchen with stainless steel appliances and and eight place dining table with access from the dining room onto a large south facing deck. IN the great rroom are high vaulted fir ceilings with huge windows oriented to the forest where you can view the magnificent Three Sisters. This level also features two bedrooms. The master has afabulous king size log bed and a large wlak in closet. The en-suite bathroom has a soaker tub and walk in shower. The second bedroom includes a double bunk bed which accesses the main three piece bathroom. We are a couple with two young children ages 3 and 5 who used to travel a lot (before children!) and would like to do so again. As the days of backpacking are over for the forseeable future we would like to travel with our family and we built the house in canmore with the hopes of being able to swap this desirable getaway location for somewhere equally interesting. We are very active people and enjoy biking and hiking. 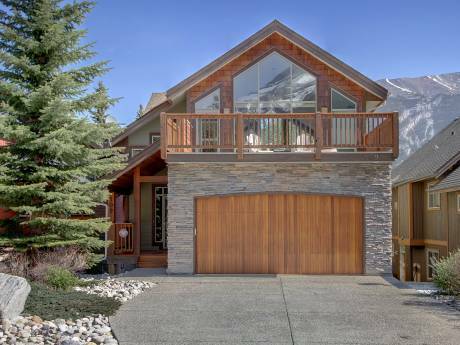 Located in the heart of the Canadian Rockies close to Banff National Park, this home is located on a quiet street of similar new homes in downtown Canmore and backs on to a forest preserve. 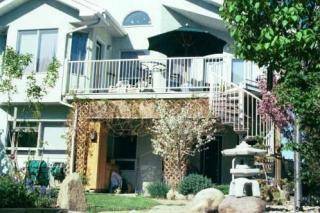 It is adjacent to hiking and mountain biking trails and a nearby golf course. A short 15 minute walk takes you to to all the amenities downtown has to offer and a 5 minute walk to the many trails that follow the Bow River. It is a fifteen minute drive to Banff and three of the Rockies premiere ski resorts are within a 1/2 hour drive.